An abstract model of the physical environment as viewed by the sensors. Taking all these aspects into account, it can provide an accurate modeling of the energy consumption. Glonemo is written in ReactiveML. The environment is modeled using Lucky, an abstract machine for the simulation of non-deterministic reactive code. Using the graphic window of ocaml, Glonemo can display the simulation progress. See the example section. March 2006 - A "fan" has been implemented in order to control the cloud! March 2006 - The sensors that have no more energy disappear. February 2006 - Now, the routing protocol directed diffusion has been implemented. The goal of the network is to detect a radioactive cloud. The cloud, modeled in Lucky is a disk. The routing layer is directed diffusion. The MAC layer is a preamble sampling mac protocol. 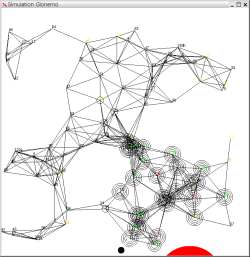 We simulate here, one hundred nodes. 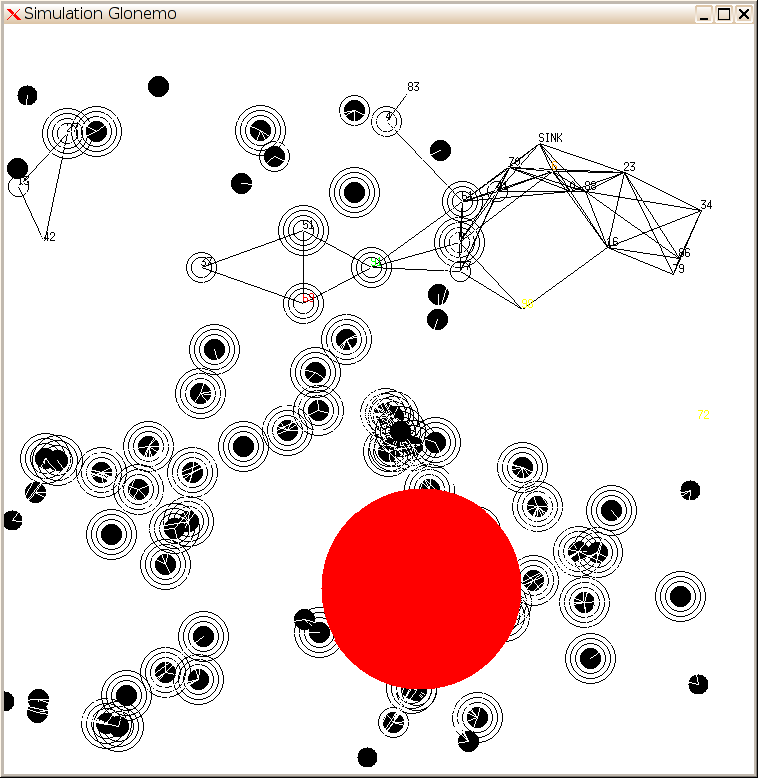 The color of the nodes indicates in which mode (sleep, idle, ...) is their radio. A node is represented by a black disk when its battery ran out of energy. The number of circles corresponds to the number of collisions suffered by the sensor. The cloud is the red disk. In the first picture, the constraints on the cloud maintained it in the down-right zone. In the second one, which is from on other simulation, the Lucky constraints prevent the cloud to go near the sink. Many thanks to Louis Mandel for the ReactiveML hotline!